I’m always looking out for ways to lower my grocery bill because let’s face it – eating healthy and making the right choices isn’t cheap. One way I save money is by only getting my fresh produce from the market and then ordering all of my non-perishables online. This works out great for me because I can easily compare prices to find the best deal. This is how I found out about Thrive Market, they offer huge discounts on healthy and organic products. Think a cross between Costco and Whole Foods (without having to purchase in quantities that could feed a family of 16 like at Costco). I was regularly saving 10%-15% off retail by purchasing my non-perishables online (mainly Amazon) so when I saw Thrive Market promised savings between 25%-50%, I had to check them out. I have been using Thrive Market now for over 6 months and have to say I absolutely love them. Thrive definitely has its drawbacks though and there are some things you really need to consider before signing up for a membership. I’ve put together this Thrive Market review to help you decide if joining Thrive Market is worth it for you. I’ll give you a quick overview of how Thrive Market works and go over some of the pros and cons of shopping at Thrive Market. I’ll also show you my last months order and compare it to if I had done the same trip on Amazon so you can get a realistic idea of how much you can save. Thrive market uses the power of direct buying and brand partnerships to cut out the middleman so you can get the best prices. The brands you see and buy at the grocery store don’t sell their products directly to these stores. They first sell wholesale to distributors, then the distributors markup the price and sell to the retail stores. Thrive Market skips the distributor and purchases directly from top brands so you don’t have to pay the retail markup. That is how they are able to offer their lower prices. However, this also means that Thrive Market can’t offer the same amount of variety that you would find at a retail supermarket. Instead Thrive Market focuses solely on Non-GMO, organic, non-perishable health food products. They also offer a limited supply of natural health/beauty products and pet supplies. Fortunately, (assuming you’re like me and mainly consume healthy food products) these are the products we would be purchasing from retail stores anyways. To join Thrive Market and take advantage of their discounted prices you’ll need to pay an annual membership fee of $59.95. I’d recommend trying out their free trial so you can do an order or two and get an idea of how much you’ll save. Unless you do a lot of shopping at places like Costco or Amazon, you’re probably not used to paying an annual fee to shop. I found the fee off putting at first until I found out what I could actually save over the course of a year. Thrive Market claims that most users pay off their annual fee in savings after just 2 orders. This was definitely true for me but it will really depend on the size of your orders. I only do 1-2 orders per month so they are generally larger orders. In fact, Thrive Market actually guarantees you’ll pay off your fee in savings by the end of the year. If you don’t they will refund you the difference in the form of store credit for your next year. Yet almost every negative Thrive Market review I’ve read is based off the membership fee. After looking into it further, I found that people weren’t upset about the actual cost of the fee, the savings more than make up for that. They were upset because they didn’t realize there was an annual fee, which is a fair complaint. If you sign up for the free trial you will be charged the annual fee if you do not cancel your membership before the trial is up. While i’m not a fan of this business tactic, it has become the norm with free trials for everything from Netflix to Amazon Prime. Register for free to browse the Thrive Market catalog, see member savings, and receive 15% off your first purchase. With your first purchase on Thrive Market, you’ll start a free 30-day membership trial. See how much you save. Cancel any time. Join Thrive Market for just $59.95 and save on the world’s best healthy products for a full year. When you join, you are also sponsoring a free membership for a low-income family. While the membership fee is easily paid for by savings, there are still some important things to consider before signing up. Let’s take a look at some of the pros and cons of using Thrive Market. My favorite part about shopping at Thrive Market (besides the savings of course) is the shop by diet feature. Grocery shopping online can be extremely difficult for those on a specific diet or with dietary restrictions. It’s hard to know exactly what you’re getting without being able to hold the product to check all the labels and ingredients. Thrive Market makes this easy by breaking everything down into categories like vegan, gluten-free, or paleo. You can check the full list of 50+ categories here. Another cool feature of using Thrive Market is the Thrive Gives charity. When you sign up for a membership Thrive Market donates a free membership to a family in need. Most low income families simply cannot afford to eat healthy. They have no option but to turn to fast food or junk foods to be able to feed their families. To make things even worse, health food stores like Whole Foods are usually only found in medium-high income neighborhoods. Thrive Market solves both of these problems by making healthy foods affordable and accessible. It’s a really easy way to make a difference for people in need. 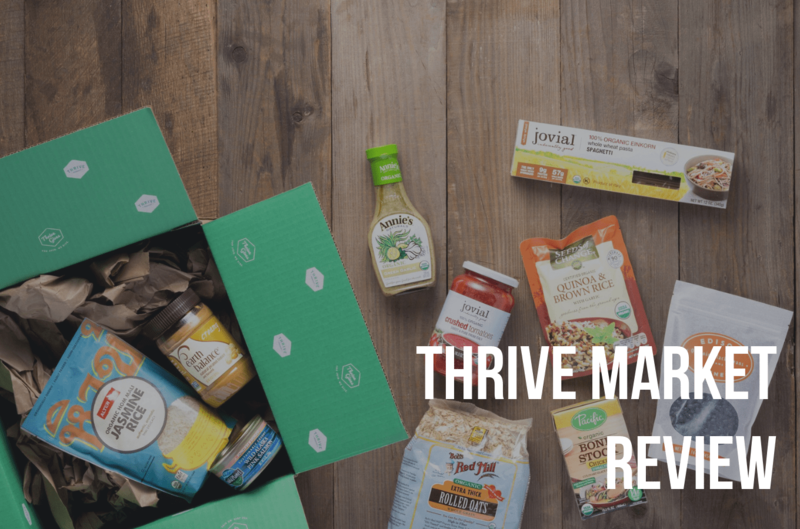 One major drawback of Thrive Market is that shipping isn’t free for orders less than $49. This hasn’t been a problem for me because I only do 1-2 larger orders per month, but it’s something you need to consider before signing up. On average, you’ll need to order about 7-8 items to get over the $49 for free shipping. This may require some planning ahead for individuals but shouldn’t be a problem for families or couples. Shipping speed is where I definitely notice a difference between Amazon and Thrive Market. I’ve been spoiled by Amazon Prime’s 2-day shipping but the reality is those shipping times aren’t possible for most companies. I get most of my Thrive Market orders 3-7 days after I place the order. I did have one Thrive order take 10 days to arrive but to be fair that included a holiday and a weekend. Overall, shopping on Thrive Market requires a little more thought and planning than just going to the store, but the savings are definitely there. So how much can you actually save by shopping at Thrive Market? Will you really get 25%-50% off your grocery bill like they claim? With Amazon’s new Prime Pantry and Amazon Fresh programs, I’d consider Amazon to be Thrive Markets main online competitor. As a retail competitor the obvious choice is Whole Foods but prices will be similar in all retail health food stores. Thrive Market is the clear winner here with 30% savings over Whole foods compared to Amazon’s 14% savings. I thought it was interesting that Amazon came close in price a lot of the time, sometimes being even cheaper. It’s important to note though a lot of the Amazon items are locked behind the $279/yr Amazon Fresh service. Others were listed through the Prime Pantry service which has a $6 shipping cost regardless of order size. Where you really save with Thrive is with the deeper discounted items or by taking advantage of their frequent coupons and promotions. In general, Thrive Market is going to save you a lot of money on your grocery bill. While you can get some items close to 50% off like they claim, I’ve found that savings were on average closer to 25%-30%. These are still great savings, I’m looking at saving around $500 per year just from shopping at Thrive Market! If you’re a couple or a family savings could be even higher. So now that you know what Thrive Market is and how much you can save, is it actually worth it? While you can easily pay off the membership fee with your savings, the answer is really going to depend on what kind of shopper you are. Families and couples will get the most out of Thrive Market. The more items you buy, the more the savings add up. If you’re already paying for an Amazon Prime membership and don’t spend a lot of money on health foods then you might consider using Prime Pantry instead. You’ll have to pay $6 shipping per order and you won’t see some of the bigger discounts that Thrive Market offers but prices on a lot of items should be similar. Overall, I think the best option is to try out the Thrive Market free trial to see if it’s a good fit for you. Just remember to cancel before the 30 days are up if you don’t want to continue the service. Thrive Market is currently offering an additional 20% off your first 3 orders when you sign up for the free trial. Click the image below to get started!